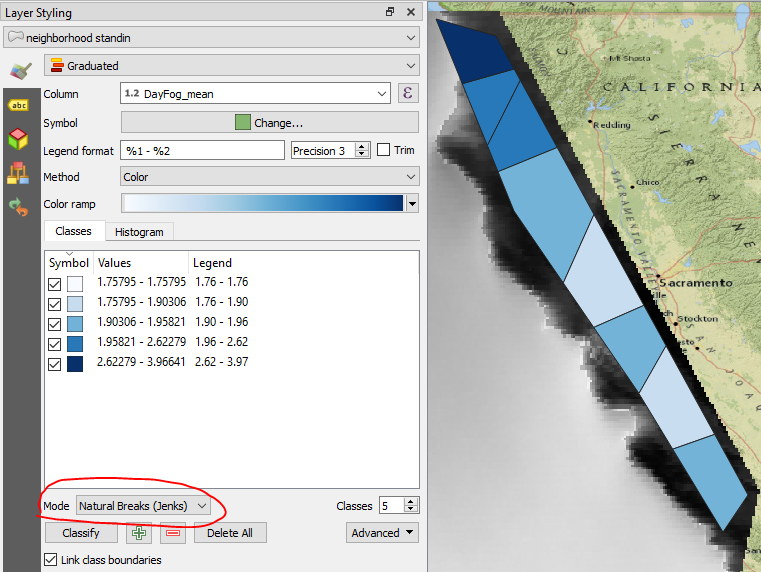 How do I turn a fog belt zone raster map into a geographic map of expected fog? 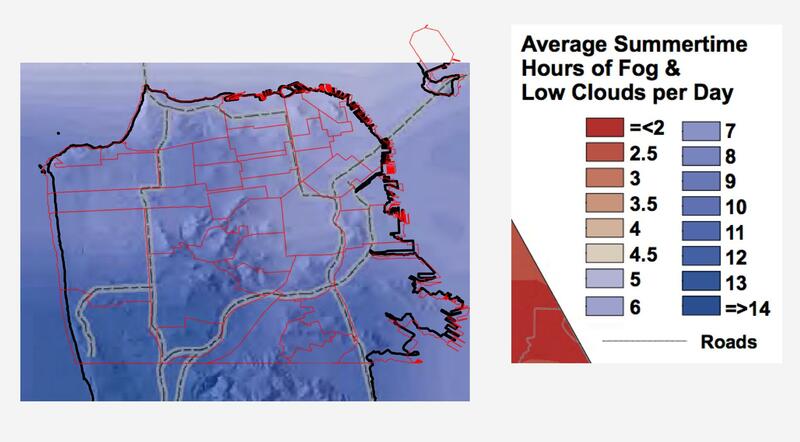 I'd like to make a map that shows the amount of fog by San Francisco neighborhood. a geoJSON file for each of the neighborhoods. I'm not sure how to read the raster map of fog belt zones. My understanding is that the area between each of the contours indicates how much fog is expected in that geographic space. It's unclear to me how to turn that into something more readily understandable, like the map I linked above. How do I translate the fog belt zones file into expected fog in geographic space? Two of the available rasters are "Decadal Daytime & Nighttime (average day/night for all 4 summer months over all available years)". If I correctly understand the provided description, you want the daytime version of this raster. Once you download all the rasters, the daytime decadal average fog raster is in this folder: decadal_rasters\decadal_rasters\flcc_deca_day. Unzip the folder and add the raster to your QGIS project. Use the Zonal Stats tool (found in the Processing Toolbox) to calculate the average hours of daytime fog in each neighborhood. (I assume you want the mean, but mode and median are also possible). Enter an understandable column name where the tool says "output column prefix," eg "DayFog_". Open the Layer Styling panel, choose "Categorized" or "Graduated" style, Select the new column ("DayFog_Mean") from the dropdown menu, and click "Classify." Now you should have each neighborhood polygon color-coded based on its average. If you choose to use "graduated" style, try out the different break modes to find one that suits your purpose. Not the answer you're looking for? Browse other questions tagged qgis raster vectorization or ask your own question. How to filter features in a layer? 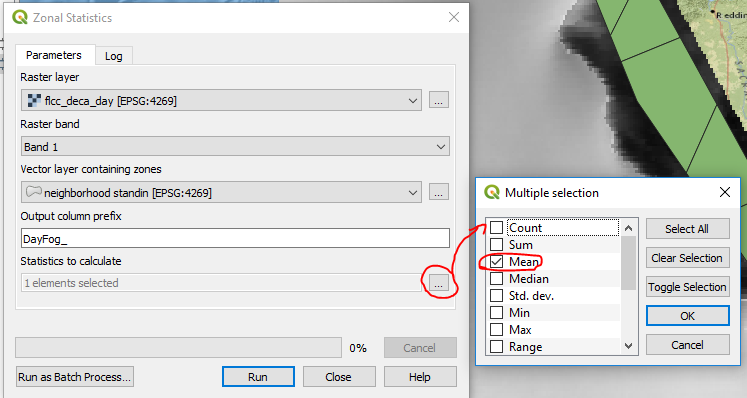 How to Separate out the disconnected regions of a raster into independent rasters using ArcGIS? Creating a quality raster map in QGIS? Why would an SVG output from CartoDB look “squished” when the map doesn't? (QGIS) How can I join overlapping polygons, retaining each overlapping pairing with proportions?